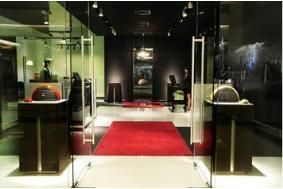 Meridian Audio expands its global chain of boutique stores | What Hi-Fi? As we reported here, Meridian launched its first, Concept store in Bangkok late last year. This was followed in 2010 by boutiques in upmarket locations in Chile, Mexico, Kuwait, Taiwan, India (Delhi and Bangalore) and, most recently, Russia. A second Russian store - in Moscow - will open next Spring, along with new shops in Singapore, China and here in the UK. Meridian Audio sells 85 percent of its products outside the UK, and both domestic (up 17 percent) and overseas sales (up 13 percent) are faring well. Graeme Taylor, Meridian Audio's chief marketing officer, explains: "While our products are made in Britain with a regional workforce, we take a global view at every level of our business. This philosophy, combined with increasingly weatlh in emerging markets and a growing desire for quality British manufacturerd products, have resulted in demand outstripping supply for our products in 2010". "For instance, our latest CD player - the 808.3 Signature Reference model - currently has a six-week waiting list, ": he continues. Each of the Meridian Boutique follows the same format, complete with dedicated in-store 'zones. These include the Gallery (pictured above), which showcases compact products such as the M80 audio system; a Concierge Reception lounge where customers can discuss system and installation needs; the Meridian Experience for technical demos of the company's home cinema products; the Crown Jewels - displaying ground-breaking Meridian products; and the Orangery - a further, flexible demo room. When we know more about the UK store, we'll be back with further news.